The Office of the Hungarian Parliament launched a creative design competition in early 2016 for architectural solutions for the façade renewal and complete overhaul of a 1970s Communist office block facing the House of Parliament. The building is located in a historic square in the heart of the Hungarian capital, diagonally opposite the famed Hungarian Parliament building. 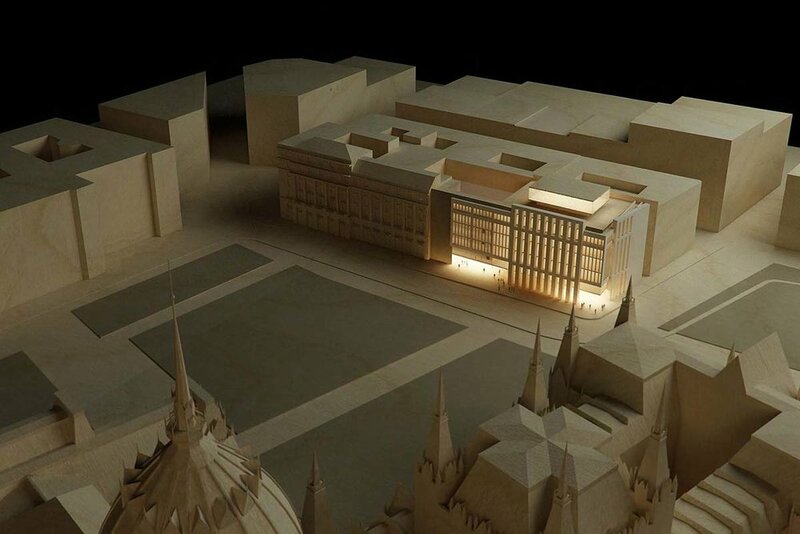 The proposals largely draw on a contextualist approach in terms of responding formally to historic adjoining façades. In addition the public realm of the main square is extended into the courtyard of the urban block within which the building sits. Whilst the courtyard is envisaged to become a memorial garden for the crushed 1956 uprising – which took place on this square – the floating penthouse structure on the roof top is intended to be a visitors’ and information centre.